Team communication is the bedrock on which productive project management is built. Jennifer Bridges, PMP, shows how you and your team can communicate effectively. Effective team communication might seem complex, but Jennifer said that when it’s boiled down to essentials, it can become very simple. People, she added, want to communicate effectively. The problem often is that they want to do it their way. Communication, though, isn’t a one-way street. What’s the Secret to Effective Team Communication? Know that People Communicate & Think Differently: It’s not just a marketing slogan for Apple; people really do think differently. But if you learn those differences you can massage your message until it’s understood. That means learning the common communication and thinking styles, but also recognizing what style you use naturally. Once you have identified other people’s styles, then you can bridge the gap and, basically, speak their language. Build a Safe Environment: Communications need to be heard, and people are less likely to hear if there’s a lot of noise, whether that’s due to an emotionally cold climate or one that is heated and stressful. So, build trust, respect and stay open to those who think differently. Allow them to share their opinions. Acknowledge Other Viewpoints: It’s not enough to let others speak their minds; you have to actively listen to them and acknowledge their points, whether you agree with them or not. They should be part of your process, because you never know where the next bright idea will originate. Also, if you’re dismissive of certain people on your team, they’re less likely to listen to you as a whole. Talk About the Common Vision or Goals: If people are not in agreement or are offering perspectives that don’t align with the overall objectives of the project, it’s important to impress upon the team that they’re all working together. There might be differing opinions on how to get there, but the endpoint is shared by all. Build Goals and Objectives: In order for the team to understand the commonality of their goals and objectives, you have to make them evident. Be clear and precise, so there is no uncertainty surrounding your actions. Consider creating SMART goals that are measurable. The stronger you can impress upon the team why they are doing what, the better they’ll do it. Have a Purpose/Intention for Every Communication: Communications are best when they stay on message, so don’t get side-tracked. Therefore, establish what you want everyone to know before they leave the meeting or start whatever task they’re assigned. State what you need from others, and know what you can do to contribute and help them. Be Positive and Fun: This might be the most important tip, for if you can foster an environment that is positive and fun, then people are more likely to listen and will work better and harder to achieve what you set out for them. You can work hard and still have fun while getting things done. Pro-Tip: Communication is a pillar of leadership. You can lead through communication by being clear, concise, easily understood, aware of context, listening and being open to feedback. 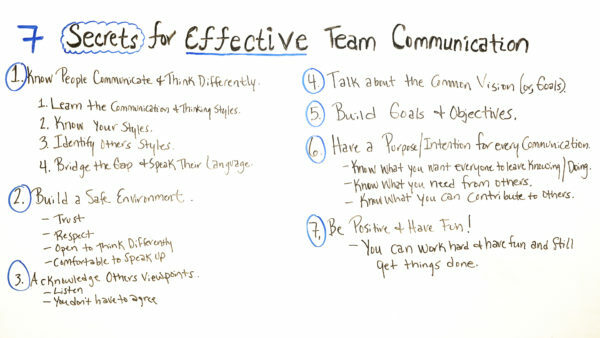 Today, we’re talking about 7 Secrets for Effective Team Communication. What I’ve learned over many years and hundreds of teams is that people on teams really do wanna communicate effectively, they just wanna communicate in their way. Another thing I’ve learned is communication can seem quite complex, but if you boil it down it can be really simple, so here are seven secrets that have helped me. So number one. Know that people communicate and think differently. So learn the communication and thinking styles. Know your style, identify others, and then bridge the gap, and speak their language. For instance, if you are a detail person, and someone is a high-level person, just understand that maybe they don’t need quite all the details that you do. So speak in their language. Number two. Build a safe environment that builds trust and respect which lends everyone open to think differently, think about other ideas that people have, and it gives people the comfort level to speak up. Number three. Acknowledge others viewpoints. Again, listen you don’t necessarily have to agree. Sometimes when I am open to do that I usually learn something different, and I’m swayed to think about things and do things a better way. So, number four. Talk about the common vision or the common goal between everyone in the team so that way you’re not thinking about what’s in it for you, you’re thinking about the collective or the greater good. Number five. Build goals and objectives. Be specific and make sure everyone knows what they’re supposed to be doing. Number six. Have a purpose or an intention for every communication, whether it’s a meeting, a phone call or any kind of electronic communication, know what you want everyone in the communication to leave knowing or doing. Also, know what you need from others, be specific, let them know what you need from them. Also, know what you can contribute to others. What are your strengths? What’s your role? What are you able to provide to help people communicate more effectively and do what they need to do? And number seven. Be positive and have fun. You can work hard and have fun, and get things done. If you need additional resources for effective team communication, then sign up for our software now at ProjectManager.com.